A placebo (/pləˈsiːboʊ/ plə-SEE-boh) is a substance or treatment of no intended therapeutic value. Common placebos include inert tablets (like sugar pills), inert injections (like saline), sham surgery, and other procedures. In drug testing and medical research, a placebo can be made to resemble an active medication or therapy so that it functions as a control; this is to prevent the recipient(s) or others from knowing (with their consent) whether a treatment is active or inactive, as expectations about efficacy can influence results. In a clinical trial any change in the placebo arm is known as the placebo response, and the difference between this and the result of no treatment is the placebo effect. A placebo may be given to a person in a clinical context in order to deceive the recipient into thinking that it is an active treatment. The use of placebos as treatment in clinical medicine is ethically problematic as it introduces deception and dishonesty into the doctor–patient relationship. 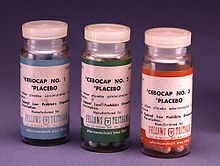 Historically, an influential 1955 study entitled The Powerful Placebo established the idea that placebo effects were clinically important, and were a result of the brain's role in physical health, but a 1997 review of the study found "no evidence [...] of any placebo effect in any of the studies cited". Subsequent research has found that placebos have no impact on diseases; they can only affect the person's perception of their own condition. Improvements that patients experience after being treated with a placebo can also be due to unrelated factors, such as a natural recovery from the illness. The word "placebo", Latin for "I will please", dates back to a Latin translation of the Bible by St Jerome. The American Society of Pain Management Nursing define a placebo as "any sham medication or procedure designed to be void of any known therapeutic value". In a clinical trial, a placebo response is the measured response of subjects to a placebo; the placebo effect is the difference between that response, and no treatment. It is also part of the recorded response to any active medical intervention. Any measurable placebo effect is termed either objective (e.g. lowered blood pressure) or subjective (e.g. a lowered perception of pain). Placebos have no meaningful therapeutic worth. They have no effect on disease, and can only affect some people's subjective judgement of their symptoms. Sometimes they can make people feel better, and sometimes worse – in which case they are termed a nocebo. Because the placebo response is simply the patient response that cannot be attributed to an investigational intervention, there are multiple possible components of a measured placebo effect. These components have varying relevance depending on study design and the types of observations. While there is some evidence that placebo interventions can alter levels of endocannabinoids or endogenous opioids, other prominent components include expectancy effects, regression to the mean, and flawed research methodologies. A review published in JAMA Psychiatry found that, in trials of antipsychotic medications, the change in response to receiving a placebo had increased significantly between 1960 and 2013. The review's authors identified several factors that could be responsible for this change, including inflation of baseline scores and enrollment of fewer severely ill patients. Another analysis published in Pain in 2015 found that placebo responses had increased considerably in neuropathic pain clinical trials conducted in the United States from 1990 to 2013. The researchers suggested that this may be because such trials have "increased in study size and length" during this time period. A 2010 Cochrane review suggests that placebo effects are only apparent in subjective, continuous measures, and in the treatment of pain and related conditions. Placebos are believed to be capable of altering a person's perception of pain. "A person might reinterpret a sharp pain as uncomfortable tingling." One way in which the magnitude of placebo analgesia can be measured is by conducting "open/hidden" studies, in which some patients receive an analgesic and are informed that they will be receiving it (open), while others are administered the same drug without their knowledge (hidden). Such studies have found that analgesics are considerably more effective when the patient knows they are receiving them. In 2008, a controversial meta-analysis led by psychologist Irving Kirsch, analyzing data from the FDA, concluded that 82% of the response to antidepressants was accounted for by placebos. However, there are serious doubts about the used methods and the interpretation of the results, especially the use of 0.5 as cut-off point for the effect-size. A complete reanalysis and recalculation based on the same FDA data discovered that the Kirsch study suffered from "important flaws in the calculations". The authors concluded that although a large percentage of the placebo response was due to expectancy, this was not true for the active drug. Besides confirming drug effectiveness, they found that the drug effect was not related to depression severity. Another meta-analysis found that 79% of depressed patients receiving placebo remained well (for 12 weeks after an initial 6–8 weeks of successful therapy) compared to 93% of those receiving antidepressants. In the continuation phase however, patients on placebo relapsed significantly more often than patients on antidepressants. A phenomenon opposite to the placebo effect has also been observed. When an inactive substance or treatment is administered to a recipient who has an expectation of it having a negative impact, this intervention is known as a nocebo (Latin nocebo = "I shall harm"). A nocebo effect occurs when the recipient of an inert substance reports a negative effect or a worsening of symptoms, with the outcome resulting not from the substance itself, but from negative expectations about the treatment. Another negative consequence is that placebos can cause side-effects associated with real treatment. Withdrawal symptoms can also occur after placebo treatment. This was found, for example, after the discontinuation of the Women's Health Initiative study of hormone replacement therapy for menopause. Women had been on placebo for an average of 5.7 years. Moderate or severe withdrawal symptoms were reported by 4.8% of those on placebo compared to 21.3% of those on hormone replacement. Some suggest that existing medical treatments should be used instead of placebos, to avoid having some patients not receive medicine during the trial. Critics of the practice responded that it is unethical to prescribe treatments that do not work, and that telling a patient (as opposed to a research test subject) that a placebo is a real medication is deceptive and harms the doctor–patient relationship in the long run. Critics also argued that using placebos can delay the proper diagnosis and treatment of serious medical conditions. While some say that blanket consent, or the general consent to unspecified treatment given by patients beforehand, is ethical, others argue that patients should always obtain specific information about the name of the drug they are receiving, its side effects, and other treatment options. This view is shared by some on the grounds of patient autonomy. There are also concerns that legitimate doctors and pharmacists could open themselves up to charges of fraud or malpractice by using a placebo. Beyond ethical issues and the integrity of the doctor–patient relationship, prescribing pure placebos is bad medicine. Their effect is unreliable and unpredictable and cannot form the sole basis of any treatment on the NHS. Expectation plays a clear role. A placebo presented as a stimulant may trigger an effect on heart rhythm and blood pressure, but when administered as a depressant, the opposite effect. In psychology, the two main hypotheses of placebo effect are expectancy theory and classical conditioning. In 1985, Irving Kirsch hypothesized that placebo effects are produced by the self-fulfilling effects of response expectancies, in which the belief that one will feel different leads a person to actually feel different. According to this theory, the belief that one has received an active treatment can produce the subjective changes thought to be produced by the real treatment. Placebos can act similarly through classical conditioning, wherein a placebo and an actual stimulus are used simultaneously until the placebo is associated with the effect from the actual stimulus. Both conditioning and expectations play a role in placebo effect, and make different kinds of contribution. Conditioning has a longer-lasting effect, and can affect earlier stages of information processing. Those that think that a treatment will work display a stronger placebo effect than those that do not, as evidenced by a study of acupuncture. Additionally, motivation may contribute to the placebo effect. The active goals of an individual changes their somatic experience by altering the detection and interpretation of expectation-congruent symptoms, and by changing the behavioral strategies a person pursues. Motivation may link to the meaning through which people experience illness and treatment. Such meaning is derived from the culture in which they live and which informs them about the nature of illness and how it responds to treatment. Functional imaging upon placebo analgesia suggests links to the activation, and increased functional correlation between this activation, in the anterior cingulate, prefrontal, orbitofrontal and insular cortices, nucleus accumbens, amygdala, the brainstem periaqueductal gray matter, and the spinal cord. It has been known that placebo analgesia depends upon the release in the brain of endogenous opioids since 1978. Such analgesic placebos activation changes processing lower down in the brain by enhancing the descending inhibition through the periaqueductal gray on spinal nociceptive reflexes, while the expectations of anti-analgesic nocebos acts in the opposite way to block this. In conditioning, a neutral stimulus saccharin is paired in a drink with an agent that produces an unconditioned response. For example, that agent might be cyclophosphamide, which causes immunosuppression. After learning this pairing, the taste of saccharin by itself is able to cause immunosuppression, as a new conditioned response via neural top-down control. Such conditioning has been found to affect a diverse variety of not just basic physiological processes in the immune system but ones such as serum iron levels, oxidative DNA damage levels, and insulin secretion. Recent reviews have argued that the placebo effect is due to top-down control by the brain for immunity and pain. Pacheco-López and colleagues have raised the possibility of "neocortical-sympathetic-immune axis providing neuroanatomical substrates that might explain the link between placebo/conditioned and placebo/expectation responses. ":441 There has also been research aiming to understand underlying neurobiological mechanisms of action in pain relief, immunosuppression, Parkinson's disease and depression. Reporting bias from experimenters, including misjudgment and irrelevant response variables. The word placebo was used in a medicinal context in the late 18th century to describe a "commonplace method or medicine" and in 1811 it was defined as "any medicine adapted more to please than to benefit the patient". Although this definition contained a derogatory implication it did not necessarily imply that the remedy had no effect. Placebos have featured in medical use until well into the twentieth century. In 1955 Henry K. Beecher published an influential paper entitled The Powerful Placebo which proposed idea that placebo effects were clinically important. Subsequent re-analysis of his materials, however, found in them no evidence of any "placebo effect". The placebo effect makes it more difficult to evaluate new treatments. Clinical trials control for this effect by including a group of subjects that receives a sham treatment. The subjects in such trials are blinded as to whether they receive the treatment or a placebo. If a person is given a placebo under one name, and they respond, they will respond in the same way on a later occasion to that placebo under that name but not if under another. Clinical trials are often double-blinded so that the researchers also do not know which test subjects are receiving the active or placebo treatment. The placebo effect in such clinical trials is weaker than in normal therapy since the subjects are not sure whether the treatment they are receiving is active. ^ Gottlieb S (18 February 2014). "The FDA Wants You for Sham Surgery". Wall Street Journal. Retrieved 8 January 2015. ^ Lanotte M, Lopiano L, Torre E, Bergamasco B, Colloca L, Benedetti F (November 2005). "Expectation enhances autonomic responses to stimulation of the human subthalamic limbic region". Brain, Behavior, and Immunity. 19 (6): 500–9. doi:10.1016/j.bbi.2005.06.004. PMID 16055306. ^ "placebo". Dictionary.com. 9 April 2016. Retrieved 21 January 2017. ^ "placebo". TheFreeDictionary.com. Retrieved 21 January 2017. ^ Newman DH (2008). Hippocrates' Shadow. Scribner. pp. 134–59. ISBN 978-1-4165-5153-9. ^ a b Hróbjartsson A, Gøtzsche PC (May 2001). "Is the placebo powerless? An analysis of clinical trials comparing placebo with no treatment". The New England Journal of Medicine. 344 (21): 1594–602. doi:10.1056/NEJM200105243442106. PMID 11372012. ^ a b c d Kienle GS, Kiene H (December 1997). "The powerful placebo effect: fact or fiction?". Journal of Clinical Epidemiology. 50 (12): 1311–8. doi:10.1016/s0895-4356(97)00203-5. PMID 9449934. ^ a b c Hróbjartsson A, Gøtzsche PC (January 2010). Hróbjartsson A, ed. "Placebo interventions for all clinical conditions" (PDF). The Cochrane Database of Systematic Reviews. 106 (1): CD003974. doi:10.1002/14651858.CD003974.pub3. PMID 20091554. ^ a b c d e f g h "Placebo Effect". American Cancer Society. 10 April 2015. ^ Jacobs B (April 2000). "Biblical origins of placebo". Journal of the Royal Society of Medicine. 93 (4): 213–4. doi:10.1177/014107680009300419. PMC 1297986. PMID 10844895. ^ Eccles R (2002). "The powerful placebo in cough studies?". Pulmonary Pharmacology & Therapeutics. 15 (3): 303–8. doi:10.1006/pupt.2002.0364. PMID 12099783. ^ Colloca L (Aug 28, 2013). Placebo and Pain: From Bench to Bedside (1st ed.). Academic Press. pp. 11–12. ISBN 978-0-12-397931-5. ^ a b Benedetti F, Mayberg HS, Wager TD, Stohler CS, Zubieta JK (November 2005). "Neurobiological mechanisms of the placebo effect". The Journal of Neuroscience. 25 (45): 10390–402. doi:10.1523/JNEUROSCI.3458-05.2005. PMID 16280578. ^ McDonald CJ, Mazzuca SA, McCabe GP (1983). "How much of the placebo 'effect' is really statistical regression?". Statistics in Medicine. 2 (4): 417–27. doi:10.1002/sim.4780020401. PMID 6369471. ^ Barnett AG, van der Pols JC, Dobson AJ (February 2005). "Regression to the mean: what it is and how to deal with it". International Journal of Epidemiology. 34 (1): 215–20. doi:10.1093/ije/dyh299. PMID 15333621. ^ Hróbjartsson A, Gøtzsche PC (August 2004). "Is the placebo powerless? Update of a systematic review with 52 new randomized trials comparing placebo with no treatment". Journal of Internal Medicine. 256 (2): 91–100. doi:10.1111/j.1365-2796.2004.01355.x. PMID 15257721. Gøtzsche's biographical article has further references related to this work. ^ Rheims S, Cucherat M, Arzimanoglou A, Ryvlin P (August 2008). Klassen T, ed. "Greater response to placebo in children than in adults: a systematic review and meta-analysis in drug-resistant partial epilepsy". PLoS Medicine. 5 (8): e166. doi:10.1371/journal.pmed.0050166. PMC 2504483. PMID 18700812. ^ Rutherford BR, Pott E, Tandler JM, Wall MM, Roose SP, Lieberman JA (December 2014). "Placebo response in antipsychotic clinical trials: a meta-analysis". JAMA Psychiatry. 71 (12): 1409–21. doi:10.1001/jamapsychiatry.2014.1319. PMC 4256120. PMID 25321611. ^ Tuttle AH, Tohyama S, Ramsay T, Kimmelman J, Schweinhardt P, Bennett GJ, Mogil JS (December 2015). "Increasing placebo responses over time in U.S. clinical trials of neuropathic pain". Pain. 156 (12): 2616–26. doi:10.1097/j.pain.0000000000000333. PMID 26307858. Lay summary. ^ Price DD, Finniss DG, Benedetti F (2008). "A comprehensive review of the placebo effect: recent advances and current thought". Annual Review of Psychology. 59 (1): 565–90. doi:10.1146/annurev.psych.59.113006.095941. PMID 17550344. ^ Turner EH, Rosenthal R (March 2008). "Efficacy of antidepressants". BMJ. 336 (7643): 516–7. doi:10.1136/bmj.39510.531597.80. PMC 2265347. PMID 18319297. ^ Fountoulakis KN, Möller HJ (April 2011). "Efficacy of antidepressants: a re-analysis and re-interpretation of the Kirsch data". The International Journal of Neuropsychopharmacology. 14 (3): 405–12. doi:10.1017/S1461145710000957. PMID 20800012. ^ Khan A, Redding N, Brown WA (August 2008). "The persistence of the placebo response in antidepressant clinical trials". Journal of Psychiatric Research. 42 (10): 791–6. doi:10.1016/j.jpsychires.2007.10.004. PMID 18036616. ^ Cho HJ, Hotopf M, Wessely S (2005). "The placebo response in the treatment of chronic fatigue syndrome: a systematic review and meta-analysis" (PDF). Psychosomatic Medicine. 67 (2): 301–13. doi:10.1097/01.psy.0000156969.76986.e0. PMID 15784798. ^ "nocebo". Mirriam-Webster Incorporated. Retrieved 22 January 2017. ^ Häuser W, Hansen E, Enck P (June 2012). "Nocebo phenomena in medicine: their relevance in everyday clinical practice". Deutsches Arzteblatt International. 109 (26): 459–65. doi:10.3238/arztebl.2012.0459. PMC 3401955. PMID 22833756. ^ "The Nocebo Effect". Priory.com. 10 February 2007. Retrieved 2009-07-08. ^ Shapiro AK, Chassan J, Morris LA, Frick R (1974). "Placebo induced side effects". Journal of Operational Psychiatry. 6: 43–6. ^ Ockene JK, Barad DH, Cochrane BB, Larson JC, Gass M, Wassertheil-Smoller S, Manson JE, Barnabei VM, Lane DS, Brzyski RG, Rosal MC, Wylie-Rosett J, Hays J (July 2005). "Symptom experience after discontinuing use of estrogen plus progestin". JAMA. 294 (2): 183–93. doi:10.1001/jama.294.2.183. PMID 16014592. ^ Howick J (September 2009). "Questioning the methodologic superiority of 'placebo' over 'active' controlled trials". The American Journal of Bioethics. 9 (9): 34–48. doi:10.1080/15265160903090041. PMID 19998192. ^ Kottow M (December 2010). "The improper use of research placebos". Journal of Evaluation in Clinical Practice. 16 (6): 1041–4. doi:10.1111/j.1365-2753.2009.01246.x. PMID 20663001. ^ Michels KB (April 2000). "The placebo problem remains". Archives of General Psychiatry. 57 (4): 321–2. doi:10.1001/archpsyc.57.4.321. PMID 10768689. ^ Altunç U, Pittler MH, Ernst E (January 2007). "Homeopathy for childhood and adolescence ailments: systematic review of randomized clinical trials". Mayo Clinic Proceedings. 82 (1): 69–75. doi:10.4065/82.1.69. PMID 17285788. ^ Asai A, Kadooka Y (May 2013). "Reexamination of the ethics of placebo use in clinical practice". Bioethics. 27 (4): 186–93. doi:10.1111/j.1467-8519.2011.01943.x. PMID 22296589. ^ Chua SJ, Pitts M (June 2015). "The ethics of prescription of placebos to patients with major depressive disorder". Chinese Medical Journal. 128 (11): 1555–7. doi:10.4103/0366-6999.157699. PMC 4733778. PMID 26021517. ^ Malani A (2008). "Regulation with Placebo Effects". Chicago Unbound. 58: 455. Retrieved 30 March 2018. ^ Spiegel D (October 2004). "Placebos in practice". BMJ. 329 (7472): 927–8. doi:10.1136/bmj.329.7472.927. PMC 524090. PMID 15499085. ^ UK Parliamentary Committee Science; Technology Committee. "Evidence Check 2: Homeopathy". Archived from the original on 2012-02-24. ^ Kirsch I (1997). "Specifying non-specifics: Psychological mechanism of the placebo effect". In Harrington A. The Placebo Effect: An Interdisciplinary Exploration. Cambridge: Harvard University Press. pp. 166–86. ISBN 978-0-674-66986-4. ^ a b c Stewart-Williams S, Podd J (March 2004). "The placebo effect: dissolving the expectancy versus conditioning debate". Psychological Bulletin. 130 (2): 324–40. doi:10.1037/0033-2909.130.2.324. PMID 14979775. ^ Kirsch I (1985). "Response expectancy as a determinant of experience and behavior". American Psychologist. 40 (11): 1189–1202. doi:10.1037/0003-066X.40.11.1189. ^ Voudouris NJ, Peck CL, Coleman G (July 1989). "Conditioned response models of placebo phenomena: further support". Pain. 38 (1): 109–16. doi:10.1016/0304-3959(89)90080-8. PMID 2780058. ^ Klinger R, Soost S, Flor H, Worm M (March 2007). "Classical conditioning and expectancy in placebo hypoalgesia: a randomized controlled study in patients with atopic dermatitis and persons with healthy skin". Pain. 128 (1–2): 31–9. doi:10.1016/j.pain.2006.08.025. PMID 17030095. ^ Colloca L, Tinazzi M, Recchia S, Le Pera D, Fiaschi A, Benedetti F, Valeriani M (October 2008). "Learning potentiates neurophysiological and behavioral placebo analgesic responses". Pain. 139 (2): 306–14. doi:10.1016/j.pain.2008.04.021. PMID 18538928. ^ Linde K, Witt CM, Streng A, Weidenhammer W, Wagenpfeil S, Brinkhaus B, Willich SN, Melchart D (April 2007). "The impact of patient expectations on outcomes in four randomized controlled trials of acupuncture in patients with chronic pain". Pain. 128 (3): 264–71. doi:10.1016/j.pain.2006.12.006. PMID 17257756. ^ Geers AL, Weiland PE, Kosbab K, Landry SJ, Helfer SG (August 2005). "Goal activation, expectations, and the placebo effect". Journal of Personality and Social Psychology. 89 (2): 143–59. doi:10.1037/0022-3514.89.2.143. PMID 16162050. ^ Oken BS (November 2008). "Placebo effects: clinical aspects and neurobiology". Brain. 131 (Pt 11): 2812–23. doi:10.1093/brain/awn116. PMC 2725026. PMID 18567924. ^ Lidstone SC, Stoessl AJ (2007). "Understanding the placebo effect: contributions from neuroimaging". Molecular Imaging and Biology. 9 (4): 176–85. doi:10.1007/s11307-007-0086-3. PMID 17334853. ^ a b Goffaux P, Redmond WJ, Rainville P, Marchand S (July 2007). "Descending analgesia--when the spine echoes what the brain expects". Pain. 130 (1–2): 137–43. doi:10.1016/j.pain.2006.11.011. PMID 17215080. ^ Qiu YH, Wu XY, Xu H, Sackett D (October 2009). "Neuroimaging study of placebo analgesia in humans". Neuroscience Bulletin. 25 (5): 277–82. doi:10.1007/s12264-009-0907-2. PMID 19784082. ^ Zubieta JK, Stohler CS (March 2009). "Neurobiological mechanisms of placebo responses". Annals of the New York Academy of Sciences. 1156 (1): 198–210. Bibcode:2009NYASA1156..198Z. doi:10.1111/j.1749-6632.2009.04424.x. PMC 3073412. PMID 19338509. ^ Levine JD, Gordon NC, Fields HL (September 1978). "The mechanism of placebo analgesia". Lancet. 2 (8091): 654–7. doi:10.1016/s0140-6736(78)92762-9. PMID 80579. ^ Faria V, Fredrikson M, Furmark T (July 2008). "Imaging the placebo response: a neurofunctional review". European Neuropsychopharmacology. 18 (7): 473–85. doi:10.1016/j.euroneuro.2008.03.002. PMID 18495442. ^ Diederich NJ, Goetz CG (August 2008). "The placebo treatments in neurosciences: New insights from clinical and neuroimaging studies". Neurology. 71 (9): 677–84. doi:10.1212/01.wnl.0000324635.49971.3d. PMID 18725593. ^ Ader R, Cohen N (1975). "Behaviorally conditioned immunosuppression". Psychosomatic Medicine. 37 (4): 333–40. doi:10.1097/00006842-197507000-00007. PMID 1162023. ^ a b Pacheco-López G, Engler H, Niemi MB, Schedlowski M (September 2006). "Expectations and associations that heal: Immunomodulatory placebo effects and its neurobiology". Brain, Behavior, and Immunity. 20 (5): 430–46. doi:10.1016/j.bbi.2006.05.003. PMID 16887325. ^ Colloca L, Benedetti F (July 2005). "Placebos and painkillers: is mind as real as matter?". Nature Reviews. Neuroscience. 6 (7): 545–52. doi:10.1038/nrn1705. PMID 15995725. ^ Murray D, Stoessl AJ (December 2013). "Mechanisms and therapeutic implications of the placebo effect in neurological and psychiatric conditions". Pharmacology & Therapeutics. 140 (3): 306–18. doi:10.1016/j.pharmthera.2013.07.009. PMID 23880289. ^ a b Golomb BA, Erickson LC, Koperski S, Sack D, Enkin M, Howick J (October 2010). "What's in placebos: who knows? Analysis of randomized, controlled trials". Annals of Internal Medicine. 153 (8): 532–5. doi:10.7326/0003-4819-153-8-201010190-00010. PMID 20956710. ^ a b Hróbjartsson A, Kaptchuk TJ, Miller FG (November 2011). "Placebo effect studies are susceptible to response bias and to other types of biases". Journal of Clinical Epidemiology. 64 (11): 1223–9. doi:10.1016/j.jclinepi.2011.01.008. PMC 3146959. PMID 21524568. ^ Shapiro AK (1968). "Semantics of the placebo". Psychiatric Quarterly. 42 (4): 653–95. doi:10.1007/BF01564309. PMID 4891851. ^ Kaptchuk TJ (June 1998). "Powerful placebo: the dark side of the randomised controlled trial". The Lancet. 351 (9117): 1722–5. doi:10.1016/S0140-6736(97)10111-8. PMID 9734904. ^ de Craen AJ, Kaptchuk TJ, Tijssen JG, Kleijnen J (October 1999). "Placebos and placebo effects in medicine: historical overview". Journal of the Royal Society of Medicine. 92 (10): 511–5. PMC 1297390. PMID 10692902. ^ Whalley B, Hyland ME, Kirsch I (May 2008). "Consistency of the placebo effect". Journal of Psychosomatic Research. 64 (5): 537–41. doi:10.1016/j.jpsychores.2007.11.007. PMID 18440407. ^ Vase L, Riley JL, Price DD (October 2002). "A comparison of placebo effects in clinical analgesic trials versus studies of placebo analgesia". Pain. 99 (3): 443–52. doi:10.1016/S0304-3959(02)00205-1. PMID 12406519.